Marimba-Synthesis by Dana Difilippantonio. For marimba, 4-mallets. 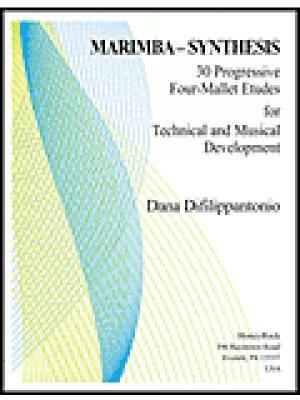 30 Progressive Four-Mallet Etudes for Technical and Musical Development. Published by HoneyRock Publishing (HR.HRMC016). This collection of etudes is intended for marimbists at all performance levels - beginner through graduate student, the book offers approaches and challenges appropriate for any student of the marimba. 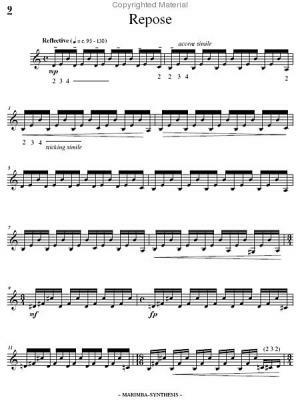 The initial etudes, such as Gentle Angles, are accessible to a novice marimba player, whereas the final etudes will challenge accomplished performers. Each etude is preceded by a description of the primary technical and musical issues to be encountered, as well as suggested exercise progressions which will assist in preparation of the etude. 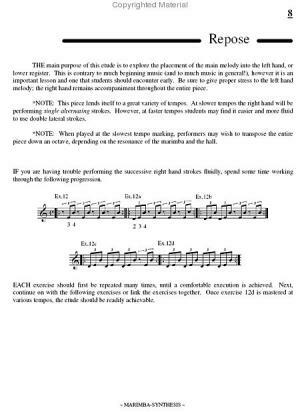 In addition, the etudes are purposefully brief, to assist memorization and accessibility. However, much care was taken to make each etude a complete composition in its own right. 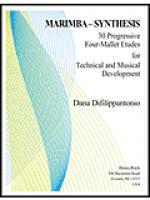 This book may be used effectively in conjunction with/or as a supplement to numerous mallet texts, including Leigh Steven's Method of Movement, as well as Luigi Morleo's 120 Progressive Four-Mallet Studies for Marimba and 60 Advanced Four-Mallet Studies for Marimba.